Spend a week serving God, building your youth ministry, and offering a transformative week to the high school kids. Here. In Syracuse. 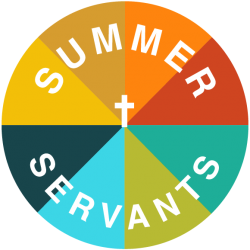 Summer Servants wants to serve your youth ministry by offering you a week-long retreat during which you and your church or school’s high school youth serve the Lord and process the change that is happening outwardly and inwardly. We strive to create an atmosphere and service experience where you can get to know who God is, and we hope that during the week your youth will accept Jesus in their hearts, and live their life in service to Him. During the week you and your team (other members from your church or school) will serve at the same location or around the same issue every day. In the morning and night there are sessions which challenge the group to BE, SEE, LISTEN, and RESPOND. There are all-camp games, free time, singing, small groups, a prayer room, devotionals, and sharing times. Breakfast and dinner is eaten at our home site, and lunch is provided to eat at your service site. There are sacramental and cultural experiences, as we learn how to have insight into God, ourselves, and His people. You should look around this site, watch the video below, and pray to decide whether this camp can help grow Christ’s love in your youths’ hearts. We know it can, because we’ve seen it.